Gender equality and the lack thereof is a pressing issue around the world today. From the issue of unequal pay between men and women in the United States to the issue of female subjugation overall in the Middle East and Africa, gender equality is a very significant top of discussion. That is not to say that it is being ignored, as clearly advances have been and are being made in bridging the gender gap around the world. However, there is still work to be done. 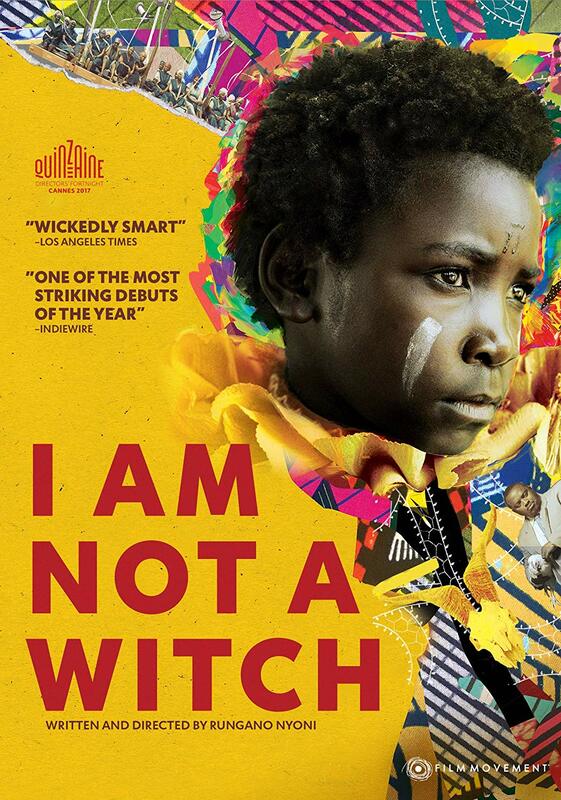 Independent movie company Film Movement did its own part in addressing the matter early this year with the domestic release of the Zambian import I Am Not A Witch. Writer/Director Runganoo Nyoni’s debut work, it is a powerful allegory about the gender gap that will keep viewers fully engaged from beginning to end. That story is just one part of what makes this movie stand out among this year’s crop of imports. The work of the movie’s cast plays into its presentation, too and will be addressed a little bit later. The bonus content included with the movie also plays into its presentation, and will be addressed a little bit later, too. Each noted item is important in its own way to the whole of I Am Not A Witch. All things considered, it can be said with ease that it is among the year’s best new independent movies. Film Movement’s recently imported Zambian movie I Am Not A Witch is a powerful new allegory about gender equality and the lack thereof. Given, it is hardly the first story to ever focus on the topic, but its approach to the subject through its story makes it stand out among that mass of movies. The story follows Shula (Maggie Mulubwa) as she is accused of witchcraft and sent to live in a community with other women who have been accused of witchcraft. No solid proof is ever given of Shula being a witch, but she never fights the charge. This is part of what makes the story so gripping, believe it or no. It will be discussed more as the cast’s on-camera work is addressed. After the other women in the community save Shula from having to work in the fields, she ends up being exploited by them and by the corrupt government official, Mr. Banda (Henry B.J. Phiri). This dual exploitation by Banda and her fellow community members, coupled with her continued exile with the other “witches” is certain to generate plenty of discussion among audiences. Forcing the women to live their lives tethered to giant spools of ribbon so that they cannot go but so far adds even more to that discussion. It is a physical metaphor to that glass ceiling, which so many societies keep women from breaking through. Not to give away too much, but the story does not have a happy ending. Rather, the ending is quite bittersweet to say the absolute least. It is an ending that will stick in viewers’ minds long after the movie ends as it puts a very powerful period on the statement about the impact of socially created gender inequality. The story overall will easily lead audiences to make comparisons to the Salem Witch Trials of 1692. However, audiences will learn through the movie’s bonus content that those trials were not the inspiration for the movie. Rather, Nyoni confirms in the noted content that her real-life experience, meeting Ghanaian women accused of witchcraft served as the inspiration for the story. That and other revelations made in the bonus content will be discussed a little later. Getting back on the subject at hand, Nyoni’s approach to the story’s core subject makes it even more engaging. It would have been so easy for her to allow the story to become another run-of-the-mill preachy finger-pointer. She did not go that route, though. Rather, she opted to take a route that made the story engaging yet simple enough in its approach that it ensures audiences get the story’s message. In other words, the story does everything right. It is just one part of what makes I Am Not A Witch stand out. The work of the movie’s cast plays into the movie’s presentation, too. The work of the movie’s main cast – Mulubwa and Phiri – is important to note in that neither actor is a professional. The juxtaposition of Banda’s vile persona to that of Shula’s innocence is expertly displayed by Phiri and Mulubwa. For being “non-professional,” each actor’s work is quite impressive. Mulubwa’s handling of Shula as she endures her constant mistreatment makes Shula the very epitome of a sympathetic character. Shula’s stoicism as she is dragged from her class mates and as she is initially accused of being a witch are just a couple of examples of Mulubwa’s acting ability. It makes viewers root for her so much. The contradiction of those moments with Shula’s happier moments – spending time with her class mates on her first day of school and her personal time with Mr. Banda’s wife – makes her even more endearing. It shows that Shula is human and has emotions, yet is being forced to hold in her emotions because she knows that those controlling her don’t care about her emotions. She knows that she is being suppressed. This in itself is an illustration of what so many women endure every day around the world. Phiri’s take on Mr. Banda is notable because he does such an impressive job of making Mr. Banda a despicable figure. From that first interaction when Banda is telling Shula that he and Shula will work together to the later moment when he threatens to send her back to work with the other “witches,” Banda proves to be a figure that audiences will love to hate. Phiri’s body language and his facial reactions as he tells Shula about working together creates a comparison to so many dopey TV bad guys, such as Boss Hogg (Dukes of Hazard), Col. Klink (Hogan’s Heroes) and Dean Wormer (Animal House). That’s thanks to Banda’s dopey presence in this moment. By contrast, his fury following the failed interaction between Shula and the government official shows a completely different person. He yells at his wife much in the same way that he did Shula later on when she refused to unlock the van for him. Banda’s wife worked to try and get Shula to react. She was presenting a sort of motherly presence, and made her just as sympathetic as Shula. That contrast to Banda’s fiery overreaction adds even more to viewers’ dislike of Banda. It illustrates even more, that Banda is doing everything that he is doing just for himself. That is revealed even more as he takes Shula on TV and is accused of mistreating her by one of the show’s callers. Between these noted moments and plenty of others, the whole of Phiri’s performance proves just as entertaining as that of Mulubwa. When their collective performances are coupled with the engagement ensured by the movie’s story, the movie’s presentation, gives viewers plenty to appreciate. They are not the only important elements to examine, of course. The movie’s bonus content is worth noting, too. The bonus content featured in Film Movement’s DVD release of I Am Not A Witch includes a brief interview with Nyoni as well as extra background information on the movie printed inside the DVD’s case and a short film, titled Mwansa The Great. The short film is interesting in its own right, but has nothing to add in terms of the primary content that is I Am Not A Witch. The interview with Nyoni, which runs roughly three minutes, is brief. However, audiences do gain some appreciation for the movie after hearing what she had to say about the movie. Nyoni notes during her comments, that she did quite a bit of research on witches prior to writing her story, and even spent time visiting witch camps. In addition, she talks about her frustration of how the women accused of witchcraft are exploited in those real life camps. She also confirms that she intentionally wrote the story in a fashion that would make it accessible for any viewer. There is also an interesting revelation about the change in the movie’s backdrop and Shula’s own development as a character. This is one of the most important of Nyoni’s statements, as most audiences (this critic included) will not catch that connection in their initial watch. That being the case, it creates a certain “aha” moment for viewers, and in turn, will create even more appreciation for the movie in viewers’ minds. Nyoni’s brief, yet insightful interview is just part of what makes the movie’s bonus content notable. The background information provided in the movie’s packaging generates even more appreciation for the movie. It includes comments from Nyoni not included in the bonus interview, such as the revelation that Zambia, in reality, is in fact a very egalitarian society, and that the inspiration for this story came from visits to witch camps in Ghana. Film Movement’s statement as to why the company added this movie to its collection of offerings notes what makes the story stand out – its reflection of what women around the world endure in terms of their mistreatment by society. Between this background, the background offered by Nyoni in the movie’s “liner notes” and her comments in the bonus interview, the bonus content provided with I Am Not A Witch proves to be its own important part of the movie’s presentation. When it is considered along with the work of the movie’s lead actors and the story itself, the three elements together make I Am Not A Witch a movie that anyone is a welcome alternative to Hollywood’s unending barrage of prequels, sequels, reboots and stories based on actual events. It is a very bittersweet human drama, but one that is memorable because of that nature. Early last month, independent movie studio Omnibus Entertainment brought the CG-animated import Oddsockeaters to American audiences through a partnership with Film Movement. The movie was marketed as a family-friendly flick thanks to its silly premise, and to a point, it meets that marketing with its story. This will be discussed shortly. While it is okay for some members of the family, the reality of the movie is that it is not friendly for the whole family, even despite its silly story. That is due to its content. This will be discussed later. While there are some concerns with the movie’s overall content, those concerns are not enough to completely ruin the movie. Its average price point makes the purchase one that is money well-spent. Each item noted here is important in its own way to the whole of Oddsockeaters. All things considered, they make Oddsockeaters more proof that there is a place and need for foreign cinematic offerings in today’s American cinematic universe. Americans in general know that anytime a sock disappears in the laundry, it’s typically the work of the infamous sock gnomes. However, as the Czech import Oddsockeaters reveals, the gnomes are either not the ones responsible for our socks’ disappearance, or they are not the only ones responsible for said disappearance. 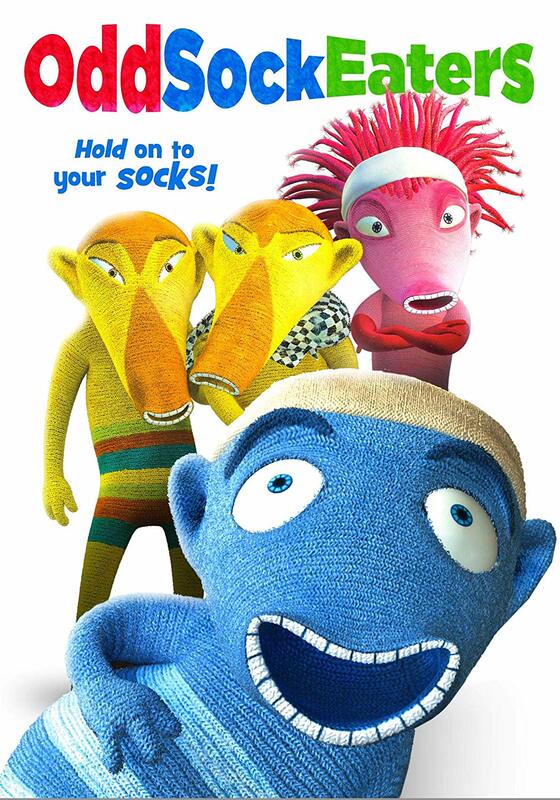 According to this movie, which was originally released in its home nation of the Czech Republic in 2016 – and imported to America this year – some magical creatures known as the Oddsockeaters play their own role in our socks’ disappearances. That premise in itself makes this movie worth at least one watch by most family members. Making it even more interesting is the dual plot presented within the story. One of the plots presented within the movie is that of two competing “criminal” Oddsockeater organizations, one of which is far more corrupt than the other, as it takes every sock possible. The other group still takes socks, but still shares with their human counterparts. The head of the more evil group, called “the blades” is a former henchman of the other group. Simply put, it’s a largely family friendly gangster flick for all intents and purposes. The other plot, which follows Hugo as he tries to find his place in the world, is a coming-of-age story of sorts that also features a central theme of the importance of family. Considering all of this, the movie’s overall story proves itself as one that will appeal to most members of the family. The one problem with the story is that there is an issue of suspension of disbelief. The Oddsockeaters are only visible to what they call “Oddies” (people who live alone and are “crazy”). So everyone else is not able to see them. Herein lies the movie’s most prominent problem. It is made clear that while only certain types of people can see the Oddsockeaters, they (the Oddsockeaters) do not know which humans are “Oddies” and which ones are not. To that end, how can they in fact be running around the city without being completely unseen? It would have to be completely by chance of luck. That very issue severely impacts the movie’s believability. Even with that in mind, suspension of disbelief is not entirely impossible, but it is not as easy as one might think, either. Considering everything noted here, the story at the center of Oddsockeaters makes the movie worth at least one watch, but not much more. The story at the center of Oddsockeaters makes the movie worth at least one watch, even despite the glaring plot hole involving who can and cannot see the magical creatures, who are themselves made of sock material. Therein is another problem. They are basically living, breathing socks that eat socks. While the story makes the movie worth at least one watch, there is some content presented throughout the story that proves the movie is not entirely as family friendly as Omnibus Entertainment and Film Movement would have audiences believe it to be. Featured within some of the dialogue are words that are clearly used to replace what would have otherwise been some very foul language in the movie’s adult counterparts. The writers pull no punches in making it clear as to what that foul language would be. At one point, one of the characters tells another – for instance – that he doesn’t “give a fluff” about something. At another, Big Boss makes mention of ripping another character from the inside out. His statement includes another word that was obviously put in place of a foul word. As if this is not enough, there are moments showing “the blades” character Bladette pulls a straight razor on other characters, putting it right to their necks. That is pretty violent imagery. At others, “The Blades’” leader pulls a knife on both his own gang members and on others. This collective imagery is an element that parents will agree is not entirely suitable for every younger viewer. To that end, while the movie might be family friendly in general, it is family friendly for certain members of the family, but not the whole family. Taking this into consideration along with the movie’s story (complete with its plot holes), it becomes even more clear why the movie is worth at least one watch, but not much more. Keeping in mind the movie’s story and the content therein, they are not the only items worth noting in examining the movie’s overall presentation. The movie’s average price point in its recent home release is important to examine, too. The average price point of Oddsockeaters is $19.84. That price point is obtained by averaging prices from Amazon, Walmart, Target, Best Buy, Books-A-Million and Barnes & Noble Booksellers. The most expensive listing (at the time of this posting) is Book-A-Million’s listing of $24.95, while the least expensive listing — $16.59 – is at Amazon and Target. $16.59 and $19.99 are the most commonly listed prices, in comparing the retailers’ listings. Considering that the most expensive listing reaches $25 and the least expensive is right at $17, that average price point of $19.84 is not too expensive. It is actually a mid-point range. In other words, audiences will not break the bank should they choose to purchase this DVD. Keeping in mind the noted elements of the movie’s story and its related content, it makes the movie’s pricing money that is well spent to a point, too. All things considered here, Oddsockeaters proves to be a movie that while maybe not friendly for the whole family, is still worth an occasional watch for some members of the family. Forget the sock gnomes. We now know what really happens to all of the socks that go missing. The answer lies in Film Movement and Omnibus Entertainment’s new quirky animated — and Dove Award-winning — family film Oddsockeaters. Scheduled for release domestically on January 8, this movie tells the story of a group of creatures that eats people’s socks. They are, fittingly called Oddsockeaters, but one of them doesn’t want to be like all the rest. Hugo wants to see what is beyond the world of the Oddsockeaters. He goes out into the world and moves in with his uncle “Big Boss” and his cousins, “Big Boss”‘ sons. He also meets “The Professor,” a human bent on revealing the Oddsockeaters, and a rival gang of Oddsockeaters known as The Blades. Hugo’s coming-of-age story teaches families invaluable lessons about family, love and the true meaning of loyalty. A trailer for the movie is streaming online now here. Oddsockeaters is based on the best-selling book series by author Pavel Srut. The movie originally debuted in its home nation of The Czech Republic Oct. 20, 2016. It was initially released on DVD internationally via Thunderbird Releasing March 18, 2018. Late last month, indie film studio Film Movement re-issued the classic 1962 romantic drama Forever My Love on DVD through its classic movies’ arm, Film Movement Classics. Coming a little more than two years after its most recent re-issue (July 1, 2016) through Entertainment One, this latest re-issue builds on that release with the inclusion of a new pair of bonus features, which are both pro and con. The fact that the movie’s footage looks exactly as it did in its original release overseas in 1962 is another item that those noted fans will appreciate about the movie’s presentation here. For all of the positives noted, the movie is not without one clear negative, its very story. Obviously fans of the movie will overlook this con, but general audiences who might not be familiar with the movie will find it reason enough to not watch the movie. This will be discussed at more length later. Keeping all of this in mind, Film Movement Classics’ recent re-issue of Forever My Love will appeal to the movie’s most devout audiences, but likely only those audiences. Film Movement Classics’ recent re-issue of Paramount Pictures’ 1962 import Forever My Love is a work that is certain to appeal to the movie’s most devout audiences. That is evidenced in part through the very look of the movie’s footage. Almost 60 years have passed since the movie, which culls material from all three of star Romy Schneider’s Sissi movies, first premiered, and it has been barely touched, if at all, since that time. All of the old scratches, the static and every other imperfection that makes classic films look so good are present from the movie’s beginning to its end. This is especially important not just for those noted devotees of Forever My Love, but also for movie buffs and historians. That is because of the sense of nostalgia that said look creates for audiences. If it had been touched up more than it was (if it was touched up at all, again), it might not have had that impact. Of course, this is all speculative, but it is clear that the look (and sound) of this presentation is the foundation of its presentation. If for no other reason than that foundation, the movie is worth at least one watch, but sadly not much more. While the look and sound of Forever My Love does plenty to appeal to the movie’s most devout audiences, the story does just as much to keep less devoted audiences from wanting to take in the movie more than once. That is due at least in part to the roughly two-and-a-half hour movie’s writing. There is no real script here, as the movie just cuts and splices bits and pieces of the Sissi trilogy into one long movie that basically outlines the couple’s life together. The story makes virtually no attempt to grab audiences until the announcement that the Empress is suffering with tuberculosis (TB). Up until that point, there is no real drama or element that will keep viewers engaged. This leads the movie to otherwise just plod along from one point to the next throughout. At least once that announcement is made, audiences have reason to become engaged. Prior to that point, though, there is just nothing positive about the story. Even more concerning is the fact that Princess Elisabeth is the Emperor’s cousin. Given, many societies worldwide “kept it in the family” long ago because they thought it kept the bloodline pure. However, in today’s age, audiences (and people in general) know the opposite to be true. To that end, two cousins marrying and even having a child together just seems to be a bit unsettling for a story line. Keeping all of this in mind, the writing (or lack thereof) detracts quite noticeably from the movie’s presentation, and reduces one’s desire to watch this movie more than once. Of course while the movie’s writing is without argument, problematic for the movie’s new DVD presentation, the bonus material does help the movie’s presentation, at least in part. 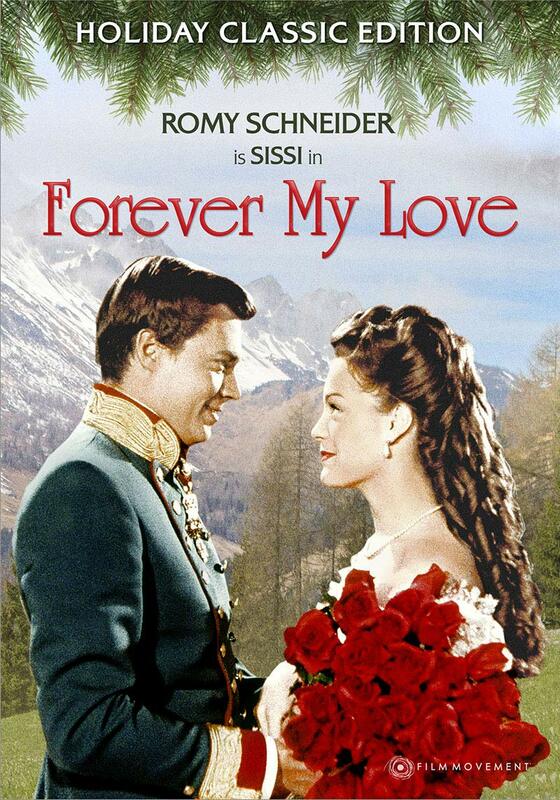 The bonus material featured in this incarnation of Forever My Love helps the movie’s presentation at least a little bit thanks to the “From Romy To Sissi” featurette. The 20-minute featurette features audio commentary from Schneider herself that follows the making of the second of the Sissi movies. Audiences learn through the brief discussion that the mountain scenes in said movie were supposed to have taken place in summer, yet were shot during winter. That explains the snow on the ground in the scenes featured in Forever My Love, as well as the fact that the Empress and Emperor were wearing thick, heavy clothes in said scenes. Schneider also notes just as briefly – and with a laugh – that her real life brothers were on set during filming of another of the trilogy’s entries, and that they allegedly were troublemakers to a point. That brief revelation will bring laughs from audiences. Just as many laughs will come as Schneider reveals a note about one of the movies’ hunting scenes. She reveals one figure behind the camera wanted to make certain that the scenes were done to certain specifications. The light-hearted revelation is sure to put smiles on audiences’ faces. Between these and other discussions raised in the featurette’s short run time, the whole of those discussions makes for its own interest for audiences. While the disc’s main bonus featurette does plenty to engage and entertain audiences, the secondary featurette, “Sissi’s Great-Grandson At The Movies” does nothing to help that interest. It is only a short segment from the bigger documentary Elisabeth: Enigma of an Empress, but paints quite a picture of that doc. That is thank primarily to the general lack of any audio balance whatsoever throughout. Between Schneider’s in-theatre discussions and his talks in his one-on-one interviews, the lack of a balance in the audio makes this brief segment completely unwatchable. The interpreter’s overdubs are at the exact same level of the audio from Schneider’s great-grandson, creating its own cacophony. The same can be said of the balance between the movie audio and the interpreter in the theater moments. The whole is experience is simply unbearable on the ears. If the rest of the doc is like this segment, then the doc in whole likely is just as unenjoyable. When this is considered with the more positive of the DVD’s main bonus featurette, the issues raised by the movie’s writing and the positive of its production values, the whole of this latest re-issue of Forever My Love is sadly a presentation that will likely *ahem* be forever forgettable, even for the most devoted fans of the classic romantic drama. Hollywood has dried up, ladies and gentlemen. That goes without saying. It’s been a while since American audiences have seen anything original from Hollywood’s “Big Six.” Thankfully though, independent studios such as Level 33 Entertainment, Cohen Media Group, IFC Films, Anchor Bay Entertainment and Film Movement have taken over time and again over the past decade or so where Hollywood has failed, with so many enjoyable offerings. Film Movement offered audiences one of the most recent of those standout offerings early this past August when it released the German import Bye Bye Germany. The 102-minute (1-hour, 42-minute) dramedy is takes place in Post World War II-era Germany, but is not another one of those run-of-the-mill stories based on actual events or even some author’s book. Rather, it is its own work that SF Weekly writer Sherilynn Connelly accurately compared to works from the famed Cohen Brothers. 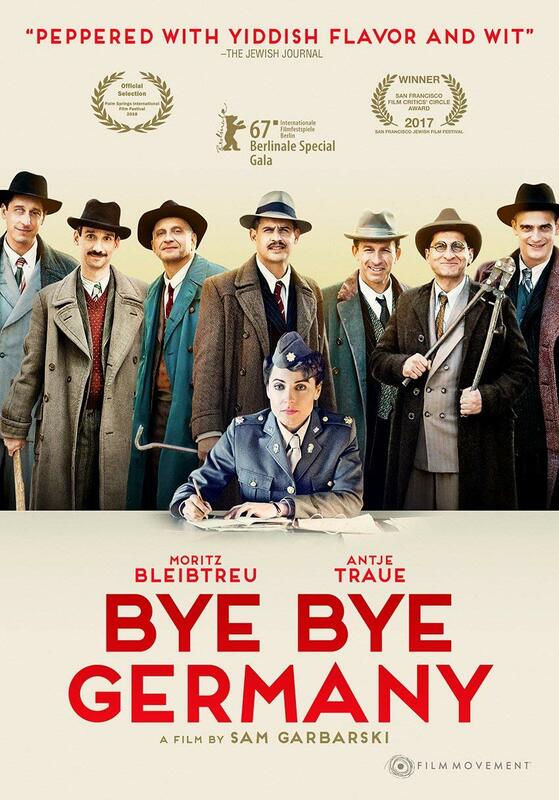 With its original story, engaging acting from its cast, and a look that pulls viewers in just as much as those noted elements, Bye Bye Germany proves to be a work that will appeal equally to fans of WWII-era stories, dramedies and anyone simply looking for an alternative to Hollywood’s seemingly endless ocean of forgettable flicks. Independent movie studio Film Movement’s recently released German import Bye Bye Germany likely will never get the attention that its American counterparts get, but the fact of the matter is that it is actually quite the entertaining offering, even being another WWII-era tale. That is thanks in part to the movie’s story. Unlike so many movies churned out by Hollywood’s “Big Six” Bye Bye Germany’s story is not another run-of-the-mill overly embellished work based on actual events. Rather, it is its own original story. The story takes audiences to Germany, 1946, just after the end of the war. A group of German Jews who survived the Holocaust have come up with a plan to get the money they need to get to America, and it involves tricking former Nazis who currently live in the region. It is complimented by a secondary story involving the group’s leader, David Bermann (Moritz Bleibtreu – Run Lola Run, In July, Atomised) being accused of conspiring with the Nazis. When one of his friends follows him to an interrogation session one day, he reports back to the others, leading to suspicion among the group. The final outcome won’t be revealed here, for the sake ok those who have not yet seen the movie, but the story overall will certainly keep audiences engaged. It is expertly balanced with the movie’s primary story to make a presentation in whole that forms a solid foundation for this movie and gives audiences plenty of reason in itself to watch. The movie’s dual-plot story is just one of the elements that makes Bye Bye Germany such an interesting presentation. The work of the movie’s cast adds even more interest to its whole. The work of the movie’s cast stands out because of the subtlety in each actor’s work. Again, viewers should take note that this is another World War II movie, so even being dramedy, it would have been so easy for Bleibtreu and his cast mates to go over the top at any given point, but they didn’t do that. Case in point is Bleibtreu’s interrogation room scenes with co-star Antje Traue (Man of Steel, Pandorum, Woman in Gold). There were moments in which Sara (Traue) asked David questions that would have allowed David to become irate, yet he never did. Rather, he responded, again, with that noted subtlety each time. The less is more approach in these tense moments adds to much depth to the scenes, and pulls audiences in even more when coupled with the story that unfolds throughout. The same can be said of the revelations from David’s friends about their own past interactions with the Nazis. One reveals how an SS officer corralled his parents and a group of other Jews into a synagogue and burned them alive, while another reveals he lost his sight when another SS officer hit him repeatedly in the eye in a bar in China. Both men could have so easily hammed it up and overly emoted, but instead used a similar subtlety as they told their stories. The result is that each story makes each character that much more sympathetic, and in turn ensures even more viewers’ engagement. Even Antje Traue adds her own touch as she intently listens to David’s recollections of his efforts to survive in the POW camp. Whether in the more emotional moments of his testimony or some of the more lighthearted moments, Traue’s reactions to David’s testimony is spot on. Considering this and the other noted cast members’ work on camera (including that work not noted here), it can be said with ease that the work of the movie’s cast adds its own depth to the story; depth that in turn ensures even more, viewers’ engagement. Considering this along with the engagement insured through the movie’s story, and audiences see even more why Bye Bye Germany is well worth the watch. These elements are not the last of the movie’s most important elements. Its overall look rounds out its most important elements. IMDB.com notes in its outline for Bye Bye Germany that in making sure the look of the movie was fully believable, the set design crew made certain to only use certain material that were period accurate, right down to the concrete and wood. That applied to the movie’s main set, the crossroad. Just as important to note is the look of Bermann’s store. The broken windows and dimly lit interior, with its empty floors and walls, collectively do a good job of showing what the Nazis did to the store. In the final act, Elsa (Jeanne Werner – Tied, Before The Winter Chill, Invisible Sue) sits on a bombed out part of the crossroad that looks just like the pictures taken from the war. Even here, it is obvious that the set/art design crew wanted to get things right so as to ensure even more, viewers’ engagement through suspension of disbelief. As if all of that is not enough, the cinematic effects used in the movie’s post production add their own interesting element to the movie’s look. It seems like there is a slight sepia-tone effect similar to that used in The Cohen Brothers’ hit movie O Brother, Where Art Thou? Used here to add to the general effect and look. That subtle addition to the movie’s presentation makes for even more interest. When it is considered along with the other general effect items noted here (and those not directly noted), the overall result is a presentation that is just as visually enjoyable as it is for the rest of its content. When it is all joined together, the noted elements make Bye Bye Germany a surprisingly enjoyable presentation whose overall appeal makes it one of this year’s hidden cinematic gems. Murder mysteries and coming of age tales are among the most overly common story plots used today in literature and cinema. From the U.S. to the U.K. to points around and between, both plots – both alone and combined – they seem to be among the most popular story types among viewers and readers alike. Yet it seems in so many cases that between the genres, that there is little variance from one story to the next. Luckily though, every now and then, a little variance does happen along. 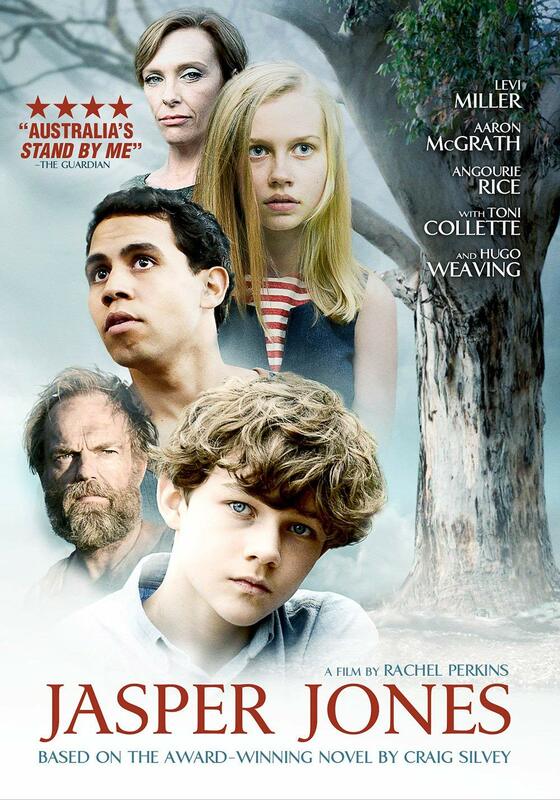 Enter the Australian import Jasper Jones. Originally released in Australia on March 2, 2017, this powerfully moving human drama made its domestic debut this past April courtesy of the independent movie studio Film Movement. Billed as “Australia’s Stand By Me,” this deeply engrossing story can also be likened in part to To Kill A Mockingbird. That is evident in the movie’s writing, which forms the foundation of the movie’s presentation. It will be discussed shortly. The cast’s on-screen work adds to the movie’s presentation, too and will keep viewers just as engaged as the movie’s central story. It will be discussed a little later. The bonus cast interviews put the final touch to the movie’s home presentation. It will also be discussed later. Each element is critical in its own way to the whole of this story. All things considered, they make Jasper Jones a movie that fans of murder mysteries and coming-of-age flicks alike will appreciate from its home country all the way to America and points in-between. Film Movement and Screen Australia’s gripping human drama Jasper Jones is a powerful cinematic work that crime drama and coming-of-age fans around the globe will appreciate. That includes American audiences who maybe are looking for something different from the constant run-of-the-mill gory crime dramas that so permeate television and theaters here in this country. That is due in no small part to its story. Unlike so many American movies and television crime dramas, this story relies solely on writing instead of blood and gore (which is what it seems so many American crime dramas rely on today) to keep viewers engaged. Here, audiences find a young boy named Charlie who…well…comes of age after being pulled into the mystery of a young girl’s death by a young man who the whole town dislikes. The townspeople dislike Jasper, it would seem, purely out of some personal bias. That bias comes into play later when the family of Charlie’s friend Jeffrey Lu is harassed by white members of the community in retaliation for Jeffrey helping his cricket team win a match. That’s getting off topic. Getting back on topic, Charlie is forced to keep secret what Jasper has revealed to him as the pair tries to figure out who killed the girl. It just so happens that the girl is the sister of Charlie’s love interest, Eliza (played here by Angourie Rice – Spiderman: Homecoming, The Nice Guys, The Beguiled). This complicates things even more until Eliza herself reveals a troubling truth about her sister’s death that puts everything on its ear, especially after the revelation of the red herring. What’s interesting about the red herring (who won’t be revealed here) is that the inclusion of the character in question, is where the comparison to Harper Collins’ great novel To Kill A Mockingbird comes into play. The character and its inclusion can so easily be likened to the use of Boo Radley in the novel in question. While all of this is going on, Charlie (who honestly, in this critic’s view looks like Joshua Jackson from his time in Disney’s Mighty Ducks franchise when he was around that age) also has to deal with family issues at home. His parents are constantly fighting, his mother is cheating on his dad (played by Dan Wyllie – The Hunter, No Activity, Muriel’s Wedding), and he is just trying to navigate it all. One can’t deny that at times, the balance between this element and the main story does cause the movie to get bogged down in itself a little bit, but thankfully it’s not so much that it makes the movie unwatchable. Rather, it could have perhaps been a little bit better balanced as it seems at times to bounce back and forth as part of the overall story. Either way, this plot element and the story’s main plot still work well enough together to keep audiences engaged throughout the course of the roughly 103-minute (1-hour, 43-minute) movie. Of course when it’s all said and done, audiences will also agree that the story overall is so powerful that one absolutely must be in a certain mindset in order to appreciate the movie’s emotional depth. It’s not one of those stories that one can just turn on any time. It really demands that much and that kind of emotional attention and connection in order to fully appreciate it’s depth. Keeping that in mind, the movie’s story is a key piece of its presentation that forms a strong foundation for its presentation. That foundation is strengthened even more through the cast’s on-camera work. The cast’s work on camera throughout this story is so critical to note because of the story’s emotional depth. It is not an easy story to take in, being so deep. That being the case, it was key for the cast to do its utmost to help illustrate that emotional depth. Each cast member did just that, beginning with lead star Levi Miller, who plays Charlie. Miller, who is a relative newcomer to the movie industry according to IMDB (it lists no film or TV credits to his name) is to be commended for his handling of Charlie as Charlie has to come to terms with everything going on in his life. One of the moments in which he shows he deserves such credit is the subtle moment early on when Jeffrey (Kevin Long – another relative newcomer to the business — is asking Charlie a bunch of “would you rather” questions on the pair’s ride to school. Charlie is clearly lost in his thoughts of what Jasper revealed to him, and it would have been so easy for Miller to go over the top in his handling of Charlie’s mentality at the moment. Instead though, he made Charlie’s mindset fully believable as someone who has really got too much for someone of such age on his mind. Miller’s handling of Charlie as he continues to struggle to tell Eliza what he discovered of her sister is another good example of what makes his work so endearing. Again, it would have been so easy for him to ham up those dramatic moments, yet his subtle acting in those moments added to the story’s tension. Even how he handled his growing frustration toward his mother, Ruth (Toni Collette – Little Miss Sunshine, The Sixth Sense, Muriel’s Wedding) shows so much talent for such a young actor. Miller’s performance throughout the story here is definitely worthy of applause. His isn’t the only applause-worthy performance, though. Collette’s work as Ruth Bucktin, Charlie’s mom, cannot and should not be overlooked. As Collette noted in the movie’s bonus interviews (the interviews will be discussed a little later), Ruth is in a place in this story in which she is trying to make sense of her life. The thing is, Ruth trying to make sense of her life makes it so easy for viewers to hate Ruth. From over reacting to the local death mystery (including forcing her son to do unnecessary back-breaking manual labor, which likely would have gotten her arrested today) to her cheating ways, Ruth is just a completely troubled character who has got a lot of problems. There is just no defending her, which it would seem is what the story was aiming for. It helped to illustrate the emotional strife that Charlie was going through and having to navigate as he also dealt with the knowledge of the girl’s death. So kudos goes to Mrs. Collette for her portrayal of Ruth. She really proves to be one of this story’s unsung stars. Hers is still not the last of the notable performances included in this movie. Aaron L. McGrath (The Code, Around The Block, Ready For This) who plays the movie’s title character, deserves his own share of attention, too. Considering that the movie is named after Jasper, but it is never explained why everyone instantly assumes he’s responsible for the disappearance of Eliza’s sister or why he appears so little on camera, McGrath does a good job of adding his own tension to the story when he is on camera. His best moment comes as he confronts Mad Jack and is forced to face a certain dark reality that will surprise everyone. The way in which McGrath presents Jasper’s mix of pained emotion as he points the rifle at Mad Jack makes one really feel for Jasper. That’s because it shows how much Jasper really cared about Eliza’s sister. This is another one of those moments in which an actor could so easily go way too far over the top, yet McGrath didn’t. Rather, he handled the moment expertly, pulling audiences in and holding them through the whole sequence. It’s just one more way in which the cast’s on-camera work here is so critical to the movie’s presentation. Each of the other cast members could just as easily be cited here, but there’s not enough time or space to pay each one the time they deserve. Keeping that in mind, the cast’s work, as shown here, couples with the story’s writing to do plenty to keep audiences completely engaged in the story from start to end. It still is not the last element to note in examining the movie’s whole. The bonus cast interviews included in the movie’s home release are also of note. Miller’s sit-down is one of the more notable of the cast interviews. His discussion on Charlie’s relationship with his parents shows the seriousness of that element of Charlie’s personal growth. The same can be said of his understanding of Charlie’s own growth from the beginning of the story to the end. His appreciation for author Craig Silvey (who wrote the book on which Jasper Jones is based) shows just as much his maturity in handling his on-screen responsibilities. One must remember in taking in these and other discussions brought up during his interview, that this is a young man who apparently had little to no screen credits coming into his role. So to hear such frank and mature discussion shows this young man is certain to have a solid acting career if given the chance. Director Rachel Perkins’ discussion on balancing the movie’s dark and light elements shows a real focus on that key detail. It’s refreshing to hear such serious attention so as to not let the movie be too depressing. Her discussions on the cast, and what made each cast member the right choice adds even more appreciation for each cast member’s work, speaking again of the cast’s work. Her discussion on the movie’s reach and accessibility is jus as enlightening because she shows she understands the importance of properly adapting a literary work to the cinematic world. She notes that Craig Silvey approved the script’s final draft, which clearly lifted a great burden from her. It’s a fun, yet clearly appreciative moment that shows how serious she took getting the adaptation right. The discussion on how the movie addresses race relations at the time at that part of the country is enlightening in its own right. Between these discussions and others that she shares, Perkins’ discussions show yet again the importance of the movie’s bonus interviews. They really add their own strength to the overall foundation of the movie’s presentation. That is shown through the other noted interviews and those not directly noted. When all of the interviews are considered along with the movie’s story and the cast’s work throughout, the end result is a work that drama fans – not just crime drama fans – the world over will appreciate. Finding presentations in this day and age that will not only bring families together but entertain adults as well as children, is a difficult task. As a matter of fact, It seems today that bringing the family together to watch anything, whether on television or on disc, is next to impossible. Finding something that will entertain the whole family at the same time is just as much of a feat. That being the case, Film Movement has potentially done the impossible with its soon to be released theatrical adaptation of author E. Nesbit’s beloved children’s book The Railway Children. Originally released on DVD overseas in 2016 from the York Theatre Royal’s stage adaptation, that presentation is scheduled to make its domestic debut April 3 via Film Movement. There is plenty to like about this presentation beginning with the story at the tale’s center. This will be discussed shortly. The presentation put on by the play’s cast does its own part to make this presentation enjoyable. It will be discussed later. The play’s production values (most notably its audio and cinematography) play their own collective role in the play’s presentation, too. Of course, there is one extra surprise connected to those values that will be discussed along with them. That item, along with the noted production items, the cast’s work and the story itself are each important in their own way to the whole of this presentation. All things considered, this domestic debut of The Railway Children‘s 2016 stage play proves to be a wonderful presentation for the whole family regardless of families’ familiarity with the story. 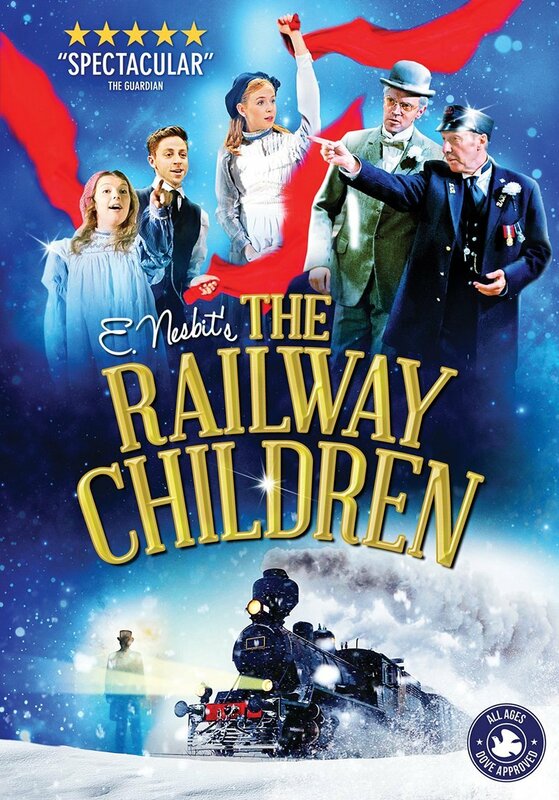 Independent movie studio Film Movement’s forthcoming domestic DVD debut of the 2016 stage adaptation of author E. Nesbit’s book The Railway Children is a miracle of a presentation. It is a work that is certain to not only bring families together, but also to entertain the whole family. That is a telling statement. It proves to be such a powerfully entertaining presentation in part through its central story. The story follows three children — Bobbie (Roberta), Phyllis and Peter — as they move from their opulent life to the Yorkshire countryside after their father is wrongly imprisoned on accusations of spying against the British. the story takes place around the time of World War I. There is an obvious statement made at one point against certain governmental styles when the children help a French-speaking Russian refugee who is searching for his wife and daughter. This critic will admit to having never read Nesbit’s original book. However, the addition of that statement to the story is something that will reach most older audiences and generate its own share of discussion among said audiences. It’s a statement that sadly is just as relevant today as it would have been in the time of the story. That’s because there are regimes around the world that would — and do — jail people for speaking their minds even today. Getting back on the subject at hand, the children’s story, that follows their daily activities as they wait for their father’s return is accessible for adults and children because it is told by the children. Speaking of this presentation, the telling of the story by the children plays into their overall performance, another important part of the play’s presentation. The cast’s presentation of the story is so important to discuss because it does so much to pull audiences into the story as the story itself. The cast — Rosalind Lailey (Bobbie), Beth Lilly (Phyllis) and Izaak Cainer (Peter) — tell the story to the audience while at the same time acting out the scenes. That balance of breaking down the fourth wall while also putting on a performance in each scene is to be commended. That is because the cast so easily moves back and forth between the two scenarios that somehow audiences are still able to maintain suspension of disbelief. It truly pulls audiences that much more into the story. It’s an enjoyable, unique approach. Staying on that note, Lailey, Lilly and Cainer are deserving of their credit for their work, not just the way in which they balance fantasy and reality. Lailey truly makes Bobbie a sympathetic character as she prays for the return of the children’s father. Her reaction when she reads in the newspaper that their father had been foudn guilty of spying (not to give away too much here) is such a painful moment. That is meant in a positive way. Lailey really makes audiences feel for Bobbie in this moment. At the same time, Bobbie’s more joyful moments such as when the Russian leans he will be reunited with his family (again, not to give away too much), will put a smile on anyone’s face. Cainer and Lilly are just as entertaining as they support Lailey. Cainer’s take on Peter offers its share of laughs. One of his best moments comes as he has to handle Bobbie thinking Peter was giving his locomotive to her. It’s a slightly emotional moment, but funny, too. It’s funny because so many audiences can relate to such a sibling scenario. Even Lilly offers her own entertainment as she breaks that fourth wall right before the play’s intermission, staying in character the whole time as she tells the audiences it was a good time to take a break. It’s a minor moment, but adds so much just because she stays in character even there. For those who might be worried, the intermission is omitted here, replaced expertly by a fade out and fade in at the intermission’s start and end respectively. Keeping all of this in mind, it becomes clear why the work of the play’s cast is so important to its overall presentation. One would be remiss to ignore the part played by the rest of the supporting cast here. The supporting cast does just as much in its time on stage as the primary cast. Again, their addition to the play shows even more why the cast’s work is so important in keeping audiences engaged and entertained. All things considered here, the work of the cast is without argument, critical to the enjoyment of this play, even on screen. When it is coupled with the story itself, the two elements go a very long way toward making this presentation worth the watch. It still is not the last of the presentation’s most important elements. The production values round out its most important elements. Considering that this plays was presented in a railway museum’s theater, audio and video were of critical importance. The cast didn’t seem to be wearing mics at any time here. If they were, then those behind the scenes are to be commended for having made them invisible to the naked eye. Regardless of mic or no, those behind the scenes are still to be commended for their work in making the sound audible for home viewers. The manner in which the cast delivers its lines — thanks to those individuals’ work — makes watching this play on screen feel almost as if one is there in person watching from some VIP box. The addition of the equally expert directing and cinematography gives home viewers the best seat in the house as so many angles are used throughout the play. Those who attended the play in person had a very limited range of vision, so having so many angles provides an even fuller experience for home viewers. It makes watching the play here on DVD even better than being there in person. That is not to say that being there likely wasn’t enjoyable in its own right. That should not be misinterpreted here. Rather, it enhances the experience that much more, and together with the solid audio engineering, makes the experience, in terms of production, completely enjoyable. Add in the inclusion of an actual engine — the same engine used in the book’s 1970 cinematic adaptation no less — and the experience becomes even more enthralling. Seeing that engine enter the theater as part of the story is just something special — again — even on screen. It adds so much with those minute appearances. Keeping all of this in mind, it should be obvious by now why the production values of The Railway Children are just as critical to its presentation as the work of the play’s cast and the play’s story. When all three elements are joined, they prove without any doubt that The Railway Children is a work that the entire family will enjoy.